Cute, colourful and simple, these two delightful versions of sushi will charm any guest at a party. Spread out a sheet of cling film, laying on top of it a 5cm square piece of ham. 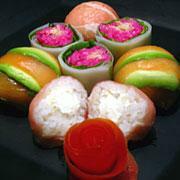 Take 30g of sushi rice and form it into a ball around 1tbsp of cream cheese. Place on top of the ham, then use the cling film to form the mixture into a ball. Cut the smoked salmon into 2cm x 5cm strips. Slice the avocado into similarly sized strips. Spread out a sheet of cling film, and layer alternate strips of both salmon and avocado, about 3 strips of each. Place 30g of sushi rice on top of the strips, then use the cling film to form the mixture into a ball. Moisten the rice paper with water then gently pat dry. Mix the grated beetroot with 80g sushi rice to make red sushi rice. Mix together the tuna and mayonnaise. Spread out a sheet of cling film, laying the rice paper on top of it, and the lettuce leaf on top of that. Then spread the red sushi on top of the lettuce leaf, and finally the tuna mayonnaise on top of that. Pick up the wrap from the edge nearest to you, and roll then rice paper up. You don’t have to roll too tightly. Once rolled, cut into three slices.